There was a pizza there that I simply couldn’t not order. 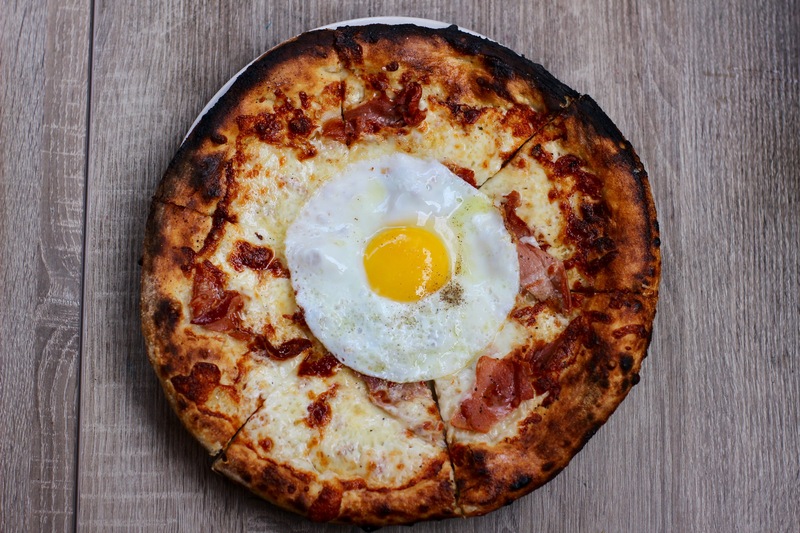 It was simply called The Egg Pizza, but the ingredients weren’t so simple. I mean, sure, there was a sunny side up egg on it, but also smoked mozzarella, prosciutto and simply extra virgin olive oil as sauce. When it arrived, I was a little surprised that the egg was just kind of in the center and just placed there, but I quickly set to work on unleashing the runny yolk and devouring the pizza. Where this pizza went well, it went really well. For example, the smoked mozzarella was fantastic to the extent that I almost think every pizza with mozzarella should consider swapping it out for the smoked variety. The egg was also cooked perfectly. As for the rest, I have some gripes. Namely, the pizza seemed to have just spent too much time in the oven. The crust was charred, and not like in a cool artsy dough bubble way. And the prosciutto followed suit, being dried up from too much time spent in the oven where it maybe shouldn’t have even been in the oven in the first place, because prosciutto doesn’t need to be cooked. Alas, this pizza showed a lot of potential. With the right cooking time, it probably could have been amazing. Unfortunately, Humble Pie just couldn’t quite get there.